The kitchen is at the heart of this custom-built dream home. With Codie Richard and her husband Matt, it all comes down to family. The couple initially began contemplating a move because of their frustration with their school system — though they had a school a block from their old home, boundaries prohibited their two sons from attending it. So, they began looking at other neighbourhoods, and other homes. Table and chairs Ethan Allan; drapery AMR Design, Brenda Brix. 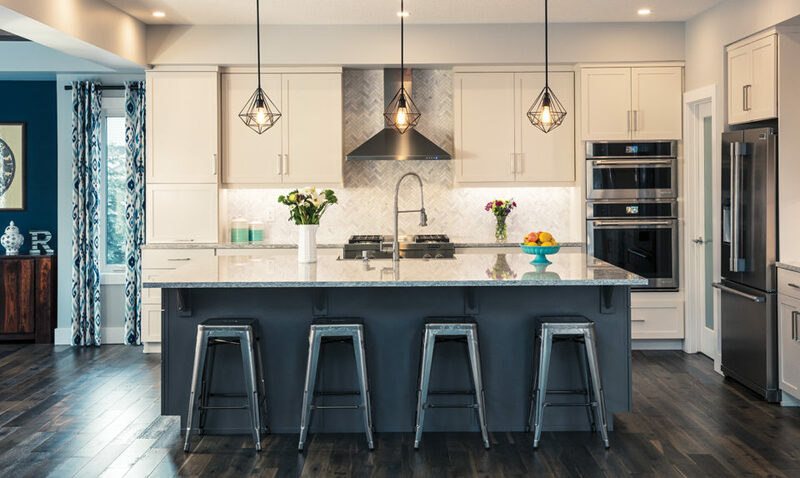 For the couple, one of the big priorities was the kitchen — and at the centre of it all is the oversized island. “I think this is one of the biggest islands that our builder had ever done,” Codie laughs. “You can never have enough island space, but we entertain quite a bit, so it’s a very useful space.” While the family’s last kitchen featured darker wood, for this home, they opted for lighter finishes.“I wanted to lighten it up in this house and make it more timeless. Since we’ll be here for a long time, I didn’t want the materials to be dated,” says Codie. Even the appliances were all chosen with care. The refrigerator is the deepest model available to sneak in all the extra possible storage, and they have a speed oven to eliminate the need for a microwave. The gas range was also chosen with home cooking in mind — though it takes up the same amount of space as a six-burner stove, the four-burner gas stove has a griddle in the middle for frying up bacon. Sectional Urban Barn; coffee table Ideal Home Furnishings; tile Payless Flooring; mantel Urban Timber; flooring Middleton Flooring Co; fireplace Fireplaces by Weiss-Johnson. The open-concept main floor also features a stunning two-storey living room filled with light, courtesy of the large windows overlooking the backyard. There are plenty of extra details, such as the wood paneling on the ceiling, but the fireplace is without a doubt the biggest focal point in the space. 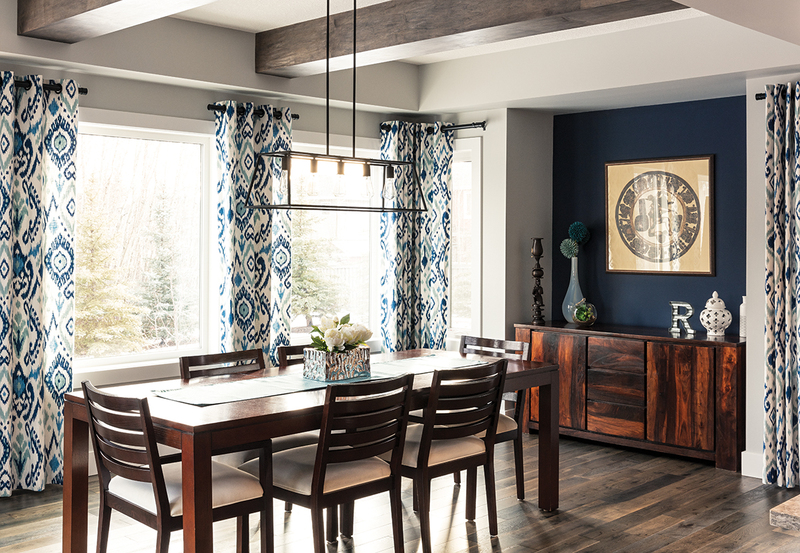 “I grew up with a hearth and a fireplace, so I just love it in the space,” says Codie. 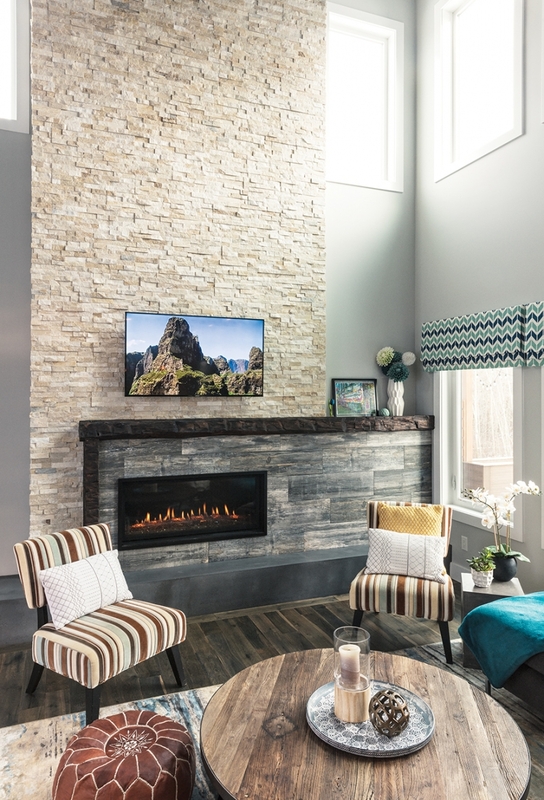 “Plus, this is a big room, we wanted something to warm it up.” It features a hollow concrete hearth that provides extra seating when necessary and an offset rustic wood detail. While the main floor is for entertaining, the basement is for family movie night. 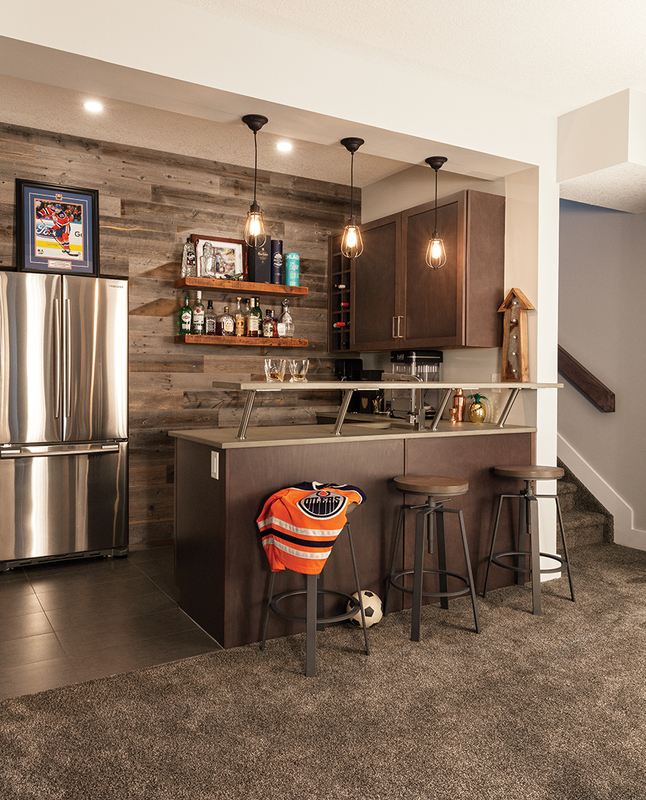 Codie designed a shelving system that adds extra storage to the space, and the wet bar is perfect for refreshments. The larger windows make the space feel light and airy, and the barn door from Urban Timber Co. and the Stikwood feature wall behind the bar add warmth to the space. “A lot of homes are being built with the upstairs bonus room, but we didn’t want that — we wanted to go old school and do the downstairs basement hangout. That’s what we all grew up with, so we prefer it,” says Codie. The second-storey master en suite was also carefully designed, with double sinks flanking either side of the tub and a vanity table, which is Codie’s favourite feature in the space. 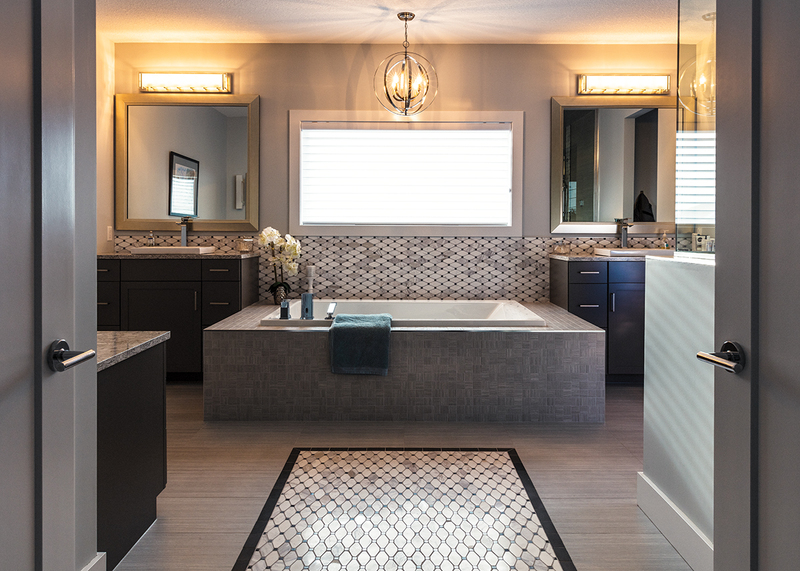 Vicky’s Homes is known for its detailed tilework, which you can see throughout the bathroom, from the backsplash to the statement tiling on the floor. The family has been in the space for roughly three years now, and while there are some projects still on the go — such as a fire pit in the backyard — they consider their Hamptons home the perfect place to grow.